The email was part of a court-ordered release of documents from Mayor Rahm Emanuel's office. CHICAGO — Gov. Bruce Rauner issued a mea culpa Thursday after the Tribune obtained and published a 2011 email in which he called half of Chicago Public Schools teachers "virtually illiterate" and half of the principals "incompetent," the newspaper reported Thursday. At the time Rauner sent the email, he was an executive in a private equity firm and deeply involved in Chicago school reform. The message was addressed to ultra-wealthy Chicago philanthropists like Penny Pritzker, Ken Griffin and Mellody Hobson, according to the Tribune. The email was part of a court ordered release of documents from Mayor Rahm Emanuel's office in connection to the SUPES academy principal training program. 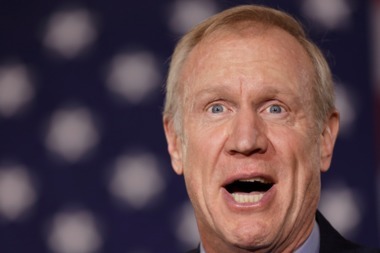 "Teacher evaluation is critically important, but in a massive bureaucracy with a hostile union, where 50% of principals are managerially incompetent and half of teachers are virtually illiterate, a complete multi-dimensional evaluation system with huge subjectivity in it will be attacked, manipulated and marginalized – the status quo will prevail," Rauner wrote in a rallying cry for stricter teacher evaluations, according to the Tribune. A lengthy statement of apology was released from Rauner's office Thursday. "Significant change can be frustratingly slow; this is especially true in public education. Many of us, at one time or another, have sent hastily crafted emails containing inaccurate or intemperate statements," Rauner spokesman Lance Trover wrote. "This particular email was sent out of frustration at the pace of change in our public school system. The Governor regrets writing it and apologizes to CPS educators for making an unfair, untrue comment." Rauner has made no secret of his enmity for the Chicago Teachers Union, whose leaders have long resisted new standardized tests and other forms of high-stakes evaluation for teachers. Last month, Rauner provoked a mighty backlash from teachers, parents and local officials when he compared the city's public schools to "crumbling prisons." Union president Karen Lewis has pulled no punches in return, at one point calling him "the new ISIS recruit" for forcing cuts to social services. A union spokesperson could not be reached for comment Thursday. Dan Montgomery, president of the Illinois Federation of Teachers, weighed in, however. “Governor Bruce Rauner's statement that half of Chicago teachers are ‘virtually illiterate’ is a grotesque affront to the thousands of dedicated, hardworking, and talented educators and, indeed, the children who learn from them and love them,” said Montgomery, a high school English teacher. “Perhaps the Governor is trying to one-up Donald Trump, whom he said he would support, in the level of hate and impropriety in civic deliberations.